Chicken in Milk is a great change from traditional roasted chicken, and so easy to make. 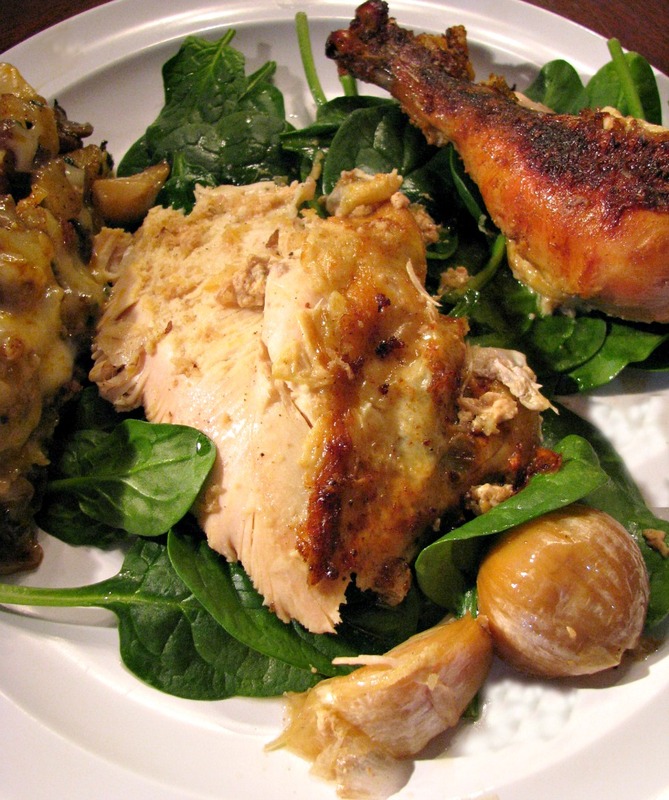 A whole chicken is braised in milk, along with lots of garlic and lemon, creating a fabulous sauce. I made this recipe for one simple reason. I bought too much milk. Like I mentioned last week I was supposed to babysit a 19-month-old for several days, but it didn’t happen. He drinks a lot of milk when he is here, so I had purchased enough for him, my own daughter, and cooking. As it turned out, I had almost two whole gallons to use up, and needed to put it in some recipes. I had read about Jamie Oliver’s Chicken in Milk a few weeks earlier. It sounded…intriguing. Chicken braised in milk with grated lemon rind. The lemon makes the milk curdle, but not in a disgusting way, in a creamy, lemony, golden delicious sauce kind of way. That’s what everything I read said, and they were right! The chicken itself is extremely moist, and falling off the bones. The sauce isn’t pretty, not at all, but it is amazing! I highly suggest serving it with the chicken. If you can’t get passed the curdles, you could put the sauce through a mesh sieve before serving to remove them, but I promise it isn’t necessary! The curdles taste like creamy, lemony, garlicy bits, that’s all. The chicken is browned in butter and oil before added the milk. I used meat lifting forks to carefully turn the chicken. The forks did put a few holes in the chicken, but it doesn’t matter since you can’t see them when the chicken is done. It will be falling apart by that point! 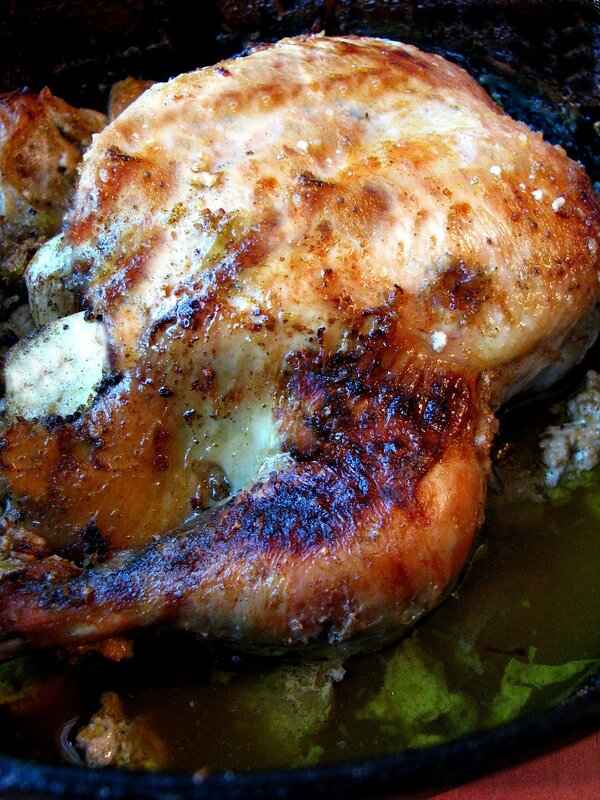 The breast doesn’t fall apart, but is incredibly moist and flavorful. 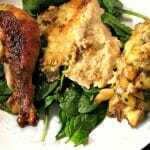 I served it over spinach along with the garlic the chicken in milk was braised with, and sauteed red potatoes with oyster mushrooms and brie (I’ll be sharing that recipe later this week). The garlic is fabulous after braising, you could use it in many dishes, like mashed potatoes, or in soups. Or just eat it, like I did! I’m not afraid of a little garlic. Or a lot. Chicken in Milk is a great change from traditional roasted chicken, and so easy to make. The chicken is braised in milk, along with lots of garlic and lemon, creating a fabulous sauce. Preheat oven to 375 degrees F. Season the chicken with salt and pepper, inside and out. Heat the butter and oil in a dutch oven or oven-proof pot with a tight fitting lid. Carefully place the chicken in the pot; fry, turning carefully, until golden all over. Remove the chicken to a plate, drain the oil from the pot. Place the chicken back in the pot, and stuff the quartered lemon in the cavity. Pour in the milk, add the unpeeled garlic, cinnamon stick, and sage. Sprinkle the lemon zest over the chicken and cover. Place in the oven and cook for one hour. Uncover, baste with the milk generously, and cook for one hour more, basting one or two more times. The chicken is done when it reaches 180 degrees in the breast with a meat thermometer. 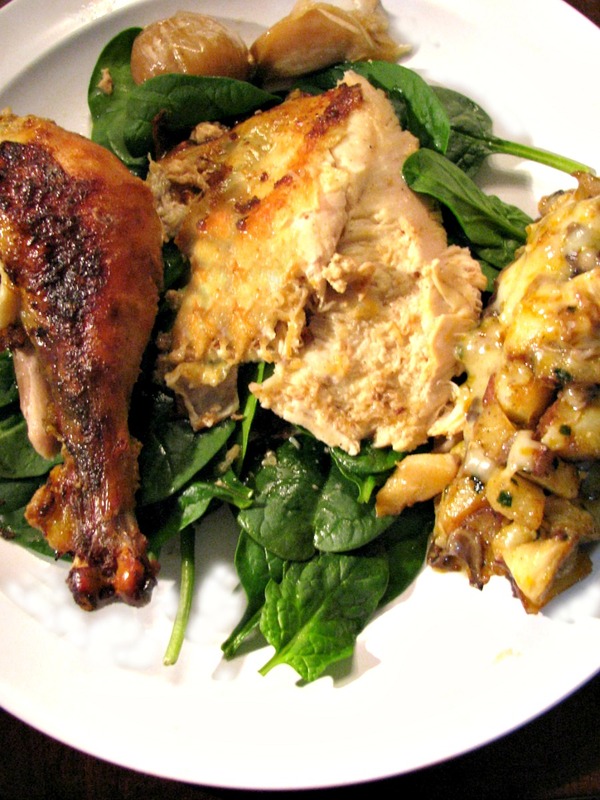 Serve over spinach with the sauce, with potatoes, or steamed carrots.